Navigating the ins and outs of a simple act of hospitality could leave you dizzy and confused. Before you stock the mini bar or reach for a cold one for a client, double-check your state and local regulations. Relaxing with a glass of wine while getting those tootsies pampered at the nail salon is as common as taking in a game over beer and wings ... but could the salon be running afoul of alcoholic beverage licensing laws? Could be, if it operates in one of the state or local municipalities that regulate possession, dispensing, or sale of alcoholic beverages. It seems simple enough. Make the right calls. Get the right permits or licenses. Continue doing what other salons have been doing without any problem for some time. Only it’s not that simple. And just because it’s a widespread practice, doesn’t mean that it’s legal or without drawbacks. Everything is blurry, the room is spinning, one eye is twitching, and I think I’m getting a headache. It has nothing to do with imbibing the intoxicating liquid though. I’m making calls looking for a few answers. If I own a salon in your state, can I serve a complimentary glass of wine while my client settles in for a pedicure or manicure? Can I sell it? What do I need to do? Where do I get a license? Starting with the letter A naturally led me to Alaska, which gave me a taste of what the rest of the U.S. had in store. Like many states, Alaska allows individual counties to opt for dry/moist status. In these areas, it may be illegal to sell, serve, or even possess alcohol. If your salon is in one of the 25+ completely dry cities of Alaska such as Emmonak, Grayling, or Scammom Bay, the answer is easy. No. I pressed the information tech further to find out that an application would need to be made to determine if a license was possible. She told me that it was hard to say without knowing the particulars. In fact, the laws were “so incomprehensible in Alaska that even the Board didn’t understand them and they had to be totally rewritten.” Almost as an afterthought, she let me know that it’s illegal for licensed bars and restaurants to give away free alcohol. Turns out the relationship between regulatory agencies, taxing authorities, and businesses is as murky in many places as it was a century ago. The Web has made information easier to access, but even in this age of technology almost half of the numbers listed were out of service or had nothing to do with alcohol regulation. Even if you pass go at the state level, local laws may differ. It becomes more confusing in Hawaii, Maryland, Nevada, and North Dakota where most enforcement is handled at the local level. In some cases the practice has gone unscrutinized for some time but once brought to light, as it was in Bismarck, N.D., city officials send warning letters to businesses, letting them know that a liquor license is required to serve any alcohol in a business — even if it’s free. Lytle does charge for drinks and says, “The customers think nothing of it.” Right now, A Perfect 10 Nail Bar is the only salon in Rapid City with a beer and wine license. District of Columbia officials parroted the same view as Tennessee in one call, but later said they would have to research it further to confirm. I’m still waiting for the answer. If you are already offering the service or thinking of adding it, start researching now. Follow up any phone conversation with a letter so you have the information in writing. While navigating the quagmire of ABC enforcement, I routinely got several different answers from the same office. One state, Virginia, followed up my interview with highlighted copies of the code. public information officer, acknowledged that only 68 day spas are currently licensed in Virginia. Part of that figure is that nails-only salons are not eligible for licensing, nor may they serve. The day spa license requires that an establishment have both cosmetology services and massage therapy to be considered. In addition, bona fide day spas must adhere to local ordinances, zoning, etc. and are restricted to serving actual clients no more than two 5-oz. servings of wine or one 12-oz. beer per day through the complimentary service. 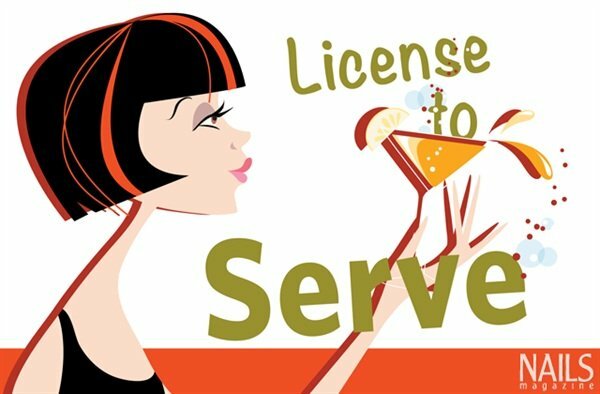 Serving in a salon without a license is a class 1 misdemeanor, carrying a fine of up to $2,500 and/or jail time. Pretty stiff penalties considering that a license is only $100 + a $65 application fee. Many states, such as New York, California, and Virginia, have special event permits that are available several times a year to cover things such as parties and grand openings. It’s obvious that the list of salons holding permits is a short one. What can be daunting is deciphering from whom that permit or license must be garnered. In California and Michigan, businesses must get approval from the state and the local municipality. In some states, such as Indiana, servers must also have a server permit. Some municipalities have further restrictions on how far a business must be from a church, school, or funeral home. Someone make that spinning stop. If you are a bit confused by the seemingly wide range of licensing restrictions, you are not alone. The state, county, and city all have a say in the matter. It’s a brave new world out there, and as fellow salons pave the way through the process, you can expect to see more Day Spa specific types of licenses evolve. > Have a discussion with your insurance agent about alcohol liability. > Develop an alcohol training program. > Set up a formal system to track distribution. > Get all rulings in writing to avoid misunderstandings. > Be prepared for a background check when applying for a liquor license. > Know that every application is unique in circumstance.